Won’t you join me…said the spider to the fly?. No tablecloth is needed…the spiders have been busy covering the surface of our table. You don’t mind spiders…dooooo you? I promised you food for our ghoulish feast, that is if you dare to eat! Wilton Food Coloring Gels…have you ever used these things? They are souper dooper concentrated, and just the smallest amount will color your icing…and your fingers…and your clothes…and your cat. Ok, just kidding about the cat…but these things are STRONG! Oh, I see your glass is empty…let me fill it for you. The menu states we’ll be drinking Molten Lava, Swamp Juice and Putrid Punch…which would you prefer? Perhaps a little of all three? Let’s start with the Swamp Juice. Don’t worry…he won’t drink much. It’s just getting dark out now. Oooooh, are you scared, yet? The floral arrangement in the background normally lives on a chest in my upstairs family room…found it many, many years ago at Old Time Pottery. I placed a string of white lights underneath the table. It gave our tablescape a nice glow up through our spider web tablecloth. Tureen is Red Cliff Ironstone. Killer Cafe menu is from Dollar Tree. Love all the great Halloween accessories and the menu. You are an inspiration Susan!! Frightfully fun and delicious! Just glad those are fun spiders. I'm not real fond of the real kind. Just fun, fun, fun! Your post today is really cute! I know that cream cheese frosting with almond flavoring is super good. Have a great Fall as we inched toward the end of the month already. Susan dear, I love your creativity! Congratulations and Happy 60th Tablescape anniversary. I'm going back now to check out every detail in your lovely tablescape ~ you always provide FABULOUS inspiration! Such a fun Halloween tablescape! Those cupcakes look delicious, too! What a fun table, Susan!! I love it! That's really fab Susan, you out did yourself. I have that same style of shutters in my kitchen, they are so wonderful. Look so fresh and clean, don't need any curtains! I love love love your halloween table, the cupcakes look so pretty and yummy! That Killer Cafe sign is just the coolest thing! never seen anything like that. I think a black bird would look great right next to it. Thanks for sharing such a fabulous tablescape! wowza that's some tablescape Susan, great job! I love it! It looks wonderful! The glasses are beautiful and I love the candlesticks. What fun it would be to have dinner there! And who could resist that menu! Thanks for another fabulous table and for hosting this weekly event. I have 2 more Halloween tables under my witches hat…tonight I even moved into the dining room..:)It's Bewitching! Have a great weekend, Susan.. This is fabulous!! You may have outdone yourself with the cobweb tablecloth! Thanks so much for hosting! And yes, I have a little trouble with user names too! I love the fun tablescape this week. Perfect for this time of year. The underlighting on the table adds so much to the atmosphere. Thank you for all your sharing with us and hosting each week. You are so creative! Just love your imagination! Adore the spiders on the stemware! The black candelabras! I was at Walmart yesterday, they did not have those wonderful pumpkin dishes! lol Love all the spiderwebs, cupcakes, love to have the book. lol Menu! Adore! Wish I could borrow this for the 26th table if I back home. I made spider mountain for my grandson Birthday Monday. Did it in 15 min. We were not having a party I was told. lol Just at school. Brought me a cake that looked like a volcano, I had spider on top with candy. I made red lava from peppermints. and mountians using black turned over pots, and red napkins crumbled and spiders everywhere. The boys loved it. Not for adults. lol Love seeing your Halloween post! Going to miss this! I LOVE your tablescape!!!! Nice job! Susan, loved the Haloween scary table, and I realllly love that soup tureen, so pretty, I think I will have to look for one like that…thanks for sharing.. Very elegant even though it's spooky! Beautiful colors! I'll take the place setting without a spider! Yikes!! This is so fun, I love it! It's inspired me to do a spooky tablescape for next time. I love the candelabras and what a deal! Susan, I LOVE this!!! Totally fun and inspiring!Thanks for hosting! I love this party!!! Wow! I don't know what one thing I like better ~ the whole table looks great. You really put a lot into this, Susan. The candelabra's do look great black! I don't have a tablescape to link up this week, but I will definitely enjoy seeing everyone elses. Well that was really fun! I think Tablescape Thursday should come with a warning label, "it will make you want to go buy things"! I find myself thinking about table settings all the time now, and this is only my second week. I love it! Awesome Susan! It looks fabulous as usual!! I love your Halloween Tablescape. We'll be starting a major kitchen remodel right around Halloween and I won't bring out those decorations this year. It'll go from Fall (right now) right to Christmas (after the remodel is done). I certainly enjoyed seeing this fun and bootiful table. Susan you get me everytime! Okay now THIS one is really my most favorite tablescape that you have ever done! Each week you just amaze me with your creativity and the remarkable beauty of them. Who knew Halloween could be so elegant and pretty! To die for! HeHe! Get it? You are so creative! How long does it take you to come up with these ideas? And do you actually eat dinner when you finish taking pics of a tablescape? I want to come have dinner with you! Too much fun! I love the Classy Flea. I can't wait to go back there. Your table NEVER disappoints! Every detail is just right. I especially love the menu! Also, would you help me win a necklace pretty please? It would mean so much to me if you would leave a quick comment on this post I have pasted below…if I get the most comments, I win. 🙂 Thank you! Ooohhh Susan…do you ever tire of the same ol accolades? Your scapes are over the top and I LOVE IT! Still waiting on word on when the tablescape book will be out…just think…the profit can pay for the livingroom makeover THEN you can do ANOTHER book of your home with the living room library included! GREAT JOB as always. THANK YOU so much for putting so much time and thought into your posts…it truly makes the difference. Susan, how do you think these things up! You have the wildest imagination!! I love how you put the lights under the table with the webby stuff!! The whole table is amazing from the menu to the pumpkin dishes to the (EEK) spiders!! Love the cupcakes too!! Only you could strike such a perfect balance between elegant artistry, pure whimsy, and gleeful ghoulishness! Great fun, perfectly presented! You never cease to amaze me with your incredible tablescapes. Those cupcakes are like something out of a magazine, divine my dear, just divine! I can't wait to try out the cream cheese frosting recipe! … Also, I have to compliment you on the photo quality, gorgeous! Very professional. I have a terrible time remembering all my logins. I don't know who could remember them all! Your spooky tablescape is very apropos to the upcoming season. Yummy cupcakes, too. thank you for bringing us all together, you really have a winning idea, it is wonderful to see so many new ways to play. Love the candelabras! What a find! I'm so not a fan of spiders. Ha! Your table is fun, frightful and whimsical all in one! Always amazed by your creativity. Oh your little good witch you – that is so cute. Where do you find the time? Your creativity never stops – bet you even dream in to die for colors and tablescapes! That table is scary gorgeous! Perfect for Halloween! Beautiful as always…. my dear! Gosh I almost forget to comment here I get so involved with all the other posts. You really went all out on this post. It is fabulous. I want you to know how much I truly enjoy all the work you go to to make this feast for my eyes. I really appreciate it!! thank you! Your Halloween table is FABULOUS!!! I would like one of those cupcakes!!! AMAZINGly and delightful frightful but in a good way! I want some swamp juice and a almondcreamcheese cupcake! I love those candlesticks! What a great find and buy! Your crystal is gorgeous! I like your spooky table. Those cupcakes are too cute and I'd bet they taste good too if you're using Paula's recipe. Love the white lights under the tablecloth! Wow Susan, this is truly inspirational. Not only did you construct a most stunning tablescape but you also baked! Amazing! I have just posted my very 1st tablescape and I really had a fun time creating it.Thanks for hosting this great experience.Can't wait to see what you have planned for next time. Best wishes, NM. Susan, Beautiful table again and again, I am running out of unique words or any words to describe your tables. Thanks for giving us the opportunity to show our tables also. Your tablescapes are stunning. Every week that I come by I am amazed at the detail that goes into your work. You are an inspiration for what to aspire to my friend. Ooooww I'm soooo afrighted!! :o) And yes, I do mind spiders, lol. Thank you, Susan, for taking the time to leave your suggestions on my upcoming Girls Tea Party. It's been helpful and most appreciated. A perfect Halloween table — love the black candlesticks! What a great idea! Your table, as always, is perfect! Lovin' on the Halloween tablescape,looks great and the cupcakes are scary, perfect too! Oh how frightful! Those spiders look so very real I found my self scratching myself thinking I had a spider on me! You are so very creative even when it comes to spooky tablescapes! Always love coming by and trying to breathe in some of your inspiration. Very nice; love that soup tureen! I'm not a spider person; until I seen them here. This is so awesome Susan for the halloween season. One of your greatest tablescape thursdays. You are so clever!! You are inspirational! How fun and cute and so so creative. I also think you should seriously consider writing a book sometime. It's sure to be a best seller. Your tablescapes are so much MORE than a beautiful table. Your creativity and funness…your ability with words…it all comes together for a magnificent post, each and every week. I want to thank you for the time and thought you put into each post…for us to enjoy. I love your candelabras, they are perfect. Great idea with the spiders on the glasses. Have a happy halloween! * FABULOUS n' FUN, too! WOW, Susan, you reeeeally put alot of time into making this INCREDIBLE!!! Funny how often I think about you, "She's outdone herself this time." But this time, I think it really might be true!! This is glorious–fun and beautiful all rolled into one. Thanks for the tip about the Wal-Mart napkins. And can I please come visit you and go with you to A Classy Flea?! That is so beautifully macabre! greatI love the menu board and the fun cupcake wrappers among many fun ideas on your table. Gorgeous tablescape, Susan but I must say – the spiders are just a little too realistic. I uncovered our grill the other night and a big spider just like the one on your soup tureen jumped out at me. Yes, I shrieked and ran back into the house. He was SCARY! Your Halloween table is to die for ! Please delete Pandora's box #9…I reposted with Linky because I just go "stupid" when I try to do this…I relisted at #89 properly!! What a fun tablescape. Putrid Punch huh? Sounds cute..how does it taste? Hi Susan! Oh how I love this. You know my kids are all gone to college and yet this year I have decorated for Halloween more than I ever have, and I have had more fun. Especially with tablescapes, signs, candies, decoupage! Oh how I love your menu, and all the extra's crawling around on your table! Big smile! Love it!!!! What a elegant halloween table-setting Susan! I really do love the chandeliers! My back is still healing so I haven;t gotten to play on Thursday's with you guys cause of all the bending and lifting. Boo hoo… Hopefully I can soon! Darling table!! So many great ideas and I am loving those candlesticks. Been thinking I want some black ones, got to keep my eye out or for some I can get at thrift and paint. Wonderful job and cupcakes too, oh girl!! how do you manage making such incredible photos in the evening!! I would love a glass of Putrid punch, please..with spiders..of course!! Where in the world do you find the time, and money, to do this? I am so, so impressed! I LOVE your Hallowe'en table! I've got something spooky up my sleeve for Hallowe'en too(coming soon). Oh Susan, I am finally here! As always, you have set a beautiful table and entertained us with your narration. As usual, you've outdone yourself. Wish I could be here for your spooky party! Oh Susan, this was so much fun! What fantastic ideas — I am completely enchanted… and not by an old witch, either! Adorable. LOVE those black candelabra. I'm not sure what Classy Flea is, but it sounds awesome. And those walmart napkins? I hope that was a recent purchase — I'm going to check that out! La mesa es absolutamente fantástica. Cuantos detalles, muy creativa. Susan, this is ANOTHER creative tablescape from you! I love it all…the china, the spiders on the goblets, the candlelabras, the tres chic napkins, the cupcakes…Very festive for the season! Your table beats all! It's just perfect, and I looove the black candlesticks. I can't believe the prices you paid for all those wonderful things, you are a great bargain shopper! It's always a treat to stop by here for a visit! You never fail to surprise and delight me. Susan, I love viewing your blog. You have a real talent for photography, the gorgeous tablescapes, plus you are well read and it shows. All together, it make for one super blog. The real Susan shines through and that's why we love your work. Made my trip to Walmart today to get those adorable pumpkin dessert/salad plates and my shadow told me that I didn't need them and how often would they be used, where will you store them? Maybe he's right; did I really need them? is it possible to be pretty and adorable at the same time??? well this sure is. I like your work today. I agree with Vicci @theplaidbasket, you should publish a tablescape book. This Halloween scape is amazing! These are great ideas – I especially like covering the table with spider webs! Everything looks wonderful! The menu is great and I love those cupcake holders. Hello thank you so much for visiting me this pink Saturday and your lovely comments on Destiny. She had so much fun participating. Wishing you a wonderful weekend. Susan! Thank you so much for posting a comment on la dolce vita featured post I have. I TRULY do appreciate it so much. I am not into Halloween BUT you did the most fun table (of course), you definitely have a gift! I know about that gel food color, it is amazing stuff, and you are right, it gets on EVERYTHING! What a fun tablescape and yet so beautiful. I especially love those candle sticks. Everything is very pretty as always. Love your tablescape as always…and love to see others as well. 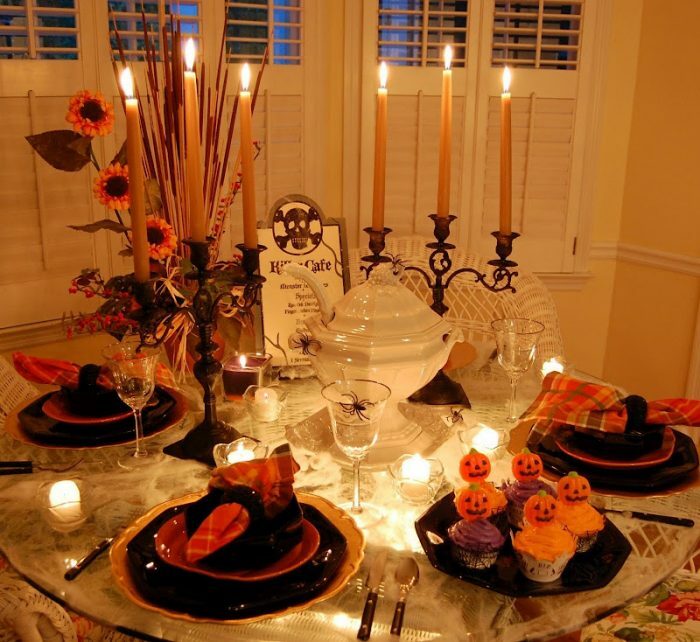 Hello sweet Susan – lovin' your spooky table scape! I am going to borrow your idea of using the spider webs for the top of the table. The little spiders are so cute! And those candelabras are really cool. I'm trying to find a pair I can spray paint. Thank you for the inspiration! You are so creative! How do you come up with all these ideas! Love that you have a way to express yourself and challenge others to do the same! susan.. I love the menu and the table… Could you email me and tell me if your cupcake cups liners.. were made by you using a silhotte… machine.. as I am trying to decide if I should buy one..
🙂 Sounds like a plan!